Next week is a huge event in Silicon Valley. August 18-19. BarCampBlock. They are dedicating an entire block in Palo Alto to celebrate the birthday of BarCamps worldwide. The first BarCamp was started at SocialText’s offices in downtown Palo Alto, which started a movement which has seen events all over the world. Thousands of people are expected. TechCrunch’s Mike Arrington wrote about it and is going. If you’re coming, make sure you sign up so that you can get into the actual event instead of just the outdoor part of the festivities. More info on the official BarCamp wiki. But yesterday I was talking to a few HP employees and told them about a marketing opportunity that’s just sitting in front of them. It would be a shame for this not to happen. Which leads me to this little garage. It’s only a short walk away from where BarCamp was born (and where next weekend’s festivities are). Almost every geek I know has never been to this garage. And, if, like Jeremiah Owyang, above, you have visited the garage, you’ve never been inside. You’re locked out of the garage by a gate. So, here’s my plea to HP. Open your garage next weekend. Lead tours. Have executives and employees there to explain its role in the world’s history. Make a bunch of T-shirts. Have them say “I visited the garage at BarCampBlock 07.” They will be popular with all the geeks. Show off your latest laptops. But get the key to that gate and open it up. It would be a gesture that will be appreciated by all BarCampers. I’ll lead walking tours of Palo Alto to the Garage if you do that. On the way you’ll see where Java was written. You’ll visit the site where the Klystron Tube was invented (the core technology behind radar and other things including what makes the Stanford Linear Accelerator work). HP: you have an extraordinary chance to congratulate the BarCamp movement. For the three people on the planet who don’t understand the role of that garage? 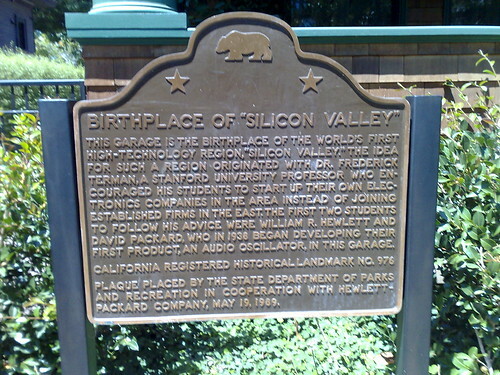 It is the birthplace of Silicon Valley. It is the iconic image of entrepreneurs everywhere who come up with ideas for companies in their metaphorical garages and dream of taking them to worldwide audiences. It is the probably the most important historical building in Silicon Valley. I want to thank HP for their help at Gnomedex! I have at least a printer to blame for them being there, and soon one of their metallic tablets! They have been more than receptive to comments from………….even dentists like me! I guess my point is, stuff like this works. Open the garage. We gotta get some fresh faces into this world. It’s not really a “happening” if I can name everyone who attends from a single wide-angle Thomas Hawk photo. Great idea, Robert. I hope they get the message and do it. I’d say more than 95% of the people on the planet today have never heard of that garage let alone understand it’s significance. I do enjoy your blog Robert but sometimes you don’t see the bigger picture. Gareth: I was trying to be funny by saying that. I know that more than five billion people don’t have their hands on a PC. Even if I don’t act like I get the bigger picture sometimes I do have that in the back of my head. Still there not the force they once where i rember in the mid 80’s we had a HP calculator that was DOA on arrival – the engineer who had it had a stream of visitors who wanted to know if this shocking fact was true and see this fabled thing a duff piece of HP kit he joked about making up a black armband. Precisely the reason to open up! 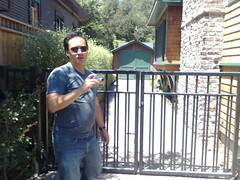 Can’t wait to have my son Sriduth Jayhari view Robert’s take on that garage. This is an AWESOME idea, Robert! Do you know anyone at HP we can talk to about this? Tara, actually, yes. They are discussing it internally today. I’ll pass them along to you in email. Thanks a lot for the information.I was not aware of the facts mentioned in theis post at all till today.Now I can share my knowledge with others when there is any discussion about silicon valley. HP really stepped up, thanks to all.